Elevator Market size was estimated over USD 87.8 billion in 2017 and the industry will grow by a CAGR of more than 4% up to 2025. Developments in the Asia Pacific building & construction industry will be the chief driver for the global elevators market growth in the forecast period. An elevator or a lift is termed as a platform or compartment that is housed in a shaft and is used to transport people and goods from one level to another in a vertical direction. The product is an integral part of high rise buildings & apartments and increasing construction activities of such buildings will boost product demand. Consisting of leading construction markets such as China, India, Japan, South Korea, and Indonesia, Asia Pacific region will be a major elevator market which will propel the product industry growth in coming years. The global construction industry will grow by an average growth rate of more than 4.5% to reach approximately USD 12.5 trillion by 2020. China will account for around 19% of this industry by 2020 with an output of more than USD 2 trillion. Indian construction market will also grow by double digit rates during this period buoyed by increasing government and foreign investment in infrastructure development. Other countries in the region such as Indonesia and Vietnam will also witness fast growth rates in their construction sectors in coming years. Rising income levels, increasing GDP, urbanization as well as industrialization are some of the factors which are driving the construction industry growth in countries of Asia Pacific. These favorable trends will boost product demand and augment the global elevators market growth in the forecast period. 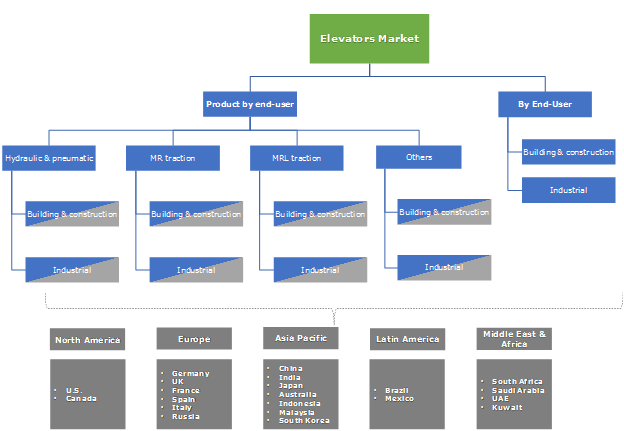 According to product, the global elevator market is segmented into hydraulic & pneumatic, machine room (MR) traction, machine room-less (MRL) traction, and other niche product types such as climbing, inclined, etc. MR traction is the largest product segment and its market will grow by a CAGR of more than 4.5% in the forecast period. This product type uses a rope, wheel, and electric motor for movement and are ideal for use in mid and high-rise buildings due to their faster speeds and longer travel distance. 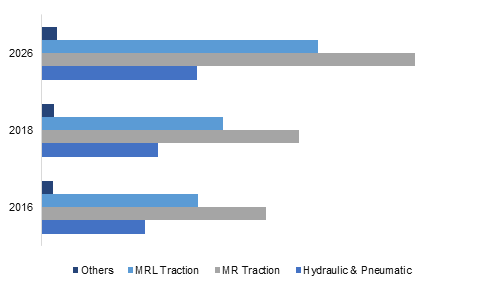 MRL traction is also a key product segment of the global lift market and the segment will gain by more than 5% CAGR in the forecast period. The absence of a dedicated machine room is the main difference between MRL and MR lifts. Their better energy efficiency when compared to other product types will be the major reason behind the MRL traction elevator market growth in the forecast period. According to end-user, the global elevator market is segmented as building & construction and industrial. The building & construction end-user is further sub-segmented into residential, institutional, and commercial. Building & construction is a largest end-user segment accounting for more than two-thirds of the market in 2017. Increasing residential and commercial infrastructure construction in Asia Pacific and the Middle East will drive the segment’s growth in the forecast period. Industrial end-user segment will grow by a CAGR of more than 3.5% in the study period. Rapid industrial development in the emerging economies across the globe will augment the segment’s market in the forecast period. Increased maintenance and service requirements for product types used in industrial applications owing to the higher amount of traffic and weight transported in them will also contribute towards the elevator market growth in the forecast period. Asia Pacific is the largest elevator market which will gain by more than 5% during the forecast period. Increasing construction industry growth in the region will be the major factor driving the segment’s market development. Rapid industrial development in the countries of Asia Pacific will also boost product demand during the forecast period. China, India, and Japan will be the key elevator markets in Asia Pacific owing to increasing number of apartment and high-rise building construction. Europe elevator market will gain by a CAGR of more than 4% in the forecast period. Developed countries in the region such as Germany, France, UK, etc. already have a matured lift market. These countries will not witness considerable growth in new product installations in the forecast period. However, product maintenance and service activities in these countries will be major contributor of growth for the Europe elevator market till 2024. Major players in the global elevator market includes KONE, Otis, Schindler, Thyssenkrupp AG, Fujitech Co. Ltd., Hitachi, Ltd., and Mitsubishi Electric Company. Other players in the market includes Express Lifts Limited, Escon Elevators Private Limited, Toshiba, Glarie, Hyundai, Eita Elevator Sdn Bhd, Orona SC, etc. Several smaller players also exist in the industry catering to local customer demand as well as involved in repair & maintenance activities. Acquisitions, mergers, and new product developments are key strategies used by industry participants to improve their competitiveness and increase their customer bases. Lifts have been in use in the world since the advent of the industrial revolution. Although rudimentary hoists have been used since the third century BC, the first steam hydraulic driven lifts came into existence during the industrial revolution. These products were used to transport large quantities of raw materials and finished products in factories across Europe. Since then, the elevator market has seen many revolutionary developments that have made the products faster, safer, and enabling them to carry more loads across longer distances. New products and hoist mechanisms have made lifts more compact and easier to install. With the global construction industry poised to grow for the next two decades, the lift market will also continue to grow till the end of the forecast period.